Sean Kelly Gallery is delighted to announce a major exhibition of photographs by Robert Mapplethorpe selected by Cindy Sherman. The exhibition, Mapplethorpe's first solo show in New York in three years, inaugurates the gallery's relationship with the Robert Mapplethorpe Foundation. The opening of the exhibition will take place on Friday, September 122h from 6pm until 8pm. Celebrated and censored, revered and reviled, notorious and noted, demonized and deified, Robert Mapplethorpe's work has never been less than controversial. This exhibition of nearly 60 works selected by artist Cindy Sherman is Mapplethorpe's work as you have never seen it before. 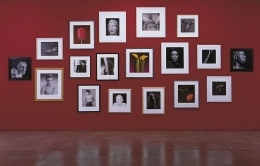 The selection by Cindy Sherman, whom Mapplethorpe photographed, facilitates the unique opportunity to see his work through another artist's eyes, indeed many of the works chosen have not previously been exhibited in New York. The exhibition contains work from all areas of Mapplethorpe's principal aesthetic interests including; still lifes, portraits, figure studies, flowers, body fragments and classical statues. Mapplethorpe's photographs exemplify classical ideals of form and proportion reminiscent of the work of Edward Weston, with their controlled relationships between light and shadow, balance and asymmetry, beauty and obscenity, whilst at the same time clearly presaging a more contemporary interest with the body and self-obsession. The formal correspondences in Mapplethorpe's images reflect the tense connections between art and society, including issues of race and sexuality. Since Mapplethorpe's untimely death in 1989, his work has been the subject of numerous exhibitions in museums throughout the world, including major traveling retrospectives. His work is widely collected, and he is unquestionably considered to be one of the most important photographers of the twentieth century.